EUCOM Families: Plan Your Weekend in Ireland! Few opportunities in life offer you the chance to realize the beauty of your home than visiting it with tourists. I had the true luck of the Irish in having had the good fortune to spend the first 15 years of my life on the Emerald Isle. I've returned many times to visit family and friends, and have since brought new family and friends along on my travels home, too. The following is the advice I’ve shared with them. Don’t try to visit Ireland in a weekend and think that you can do it justice; if you’re rushing around to visit touristy sites, you’ll miss the actual culture. Don’t take one big, boring bus tour of the country. Take time to relax in a pub, talk to the locals, enjoy the music, and see a select few places. While most military banks, including USAA, will defray the cost of driving insurance on a travel rental, if you call to request driving insurance for Ireland, they will simply laugh at you. Most roads outside of the major highways were built for horse and carts, and you’ll find that eminent domain has little sway in the countryside; individual land ownership trumps the need for road expansion, making driving nerve-wracking at best. On that note, unless you’re traveling with a whole host of baby equipment, you shouldn’t need a car. The public and private transit systems are excellent. Trains will take you to the major cities, and you can make reservations either online or at the train station itself; Dublin has an excellent and inexpensive inter-city rail system called the DART. If you’re ever lost, ask a bus conductor for directions; they’ll either ferry you to the bus stop where you need to be, or give you directions on how to get to the location you need. It’s easy to arrange tours on private coaches that will take you to the scenic sites off the main transit lines. 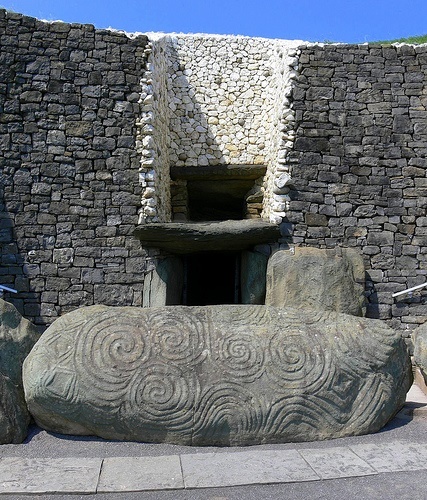 These include ancient stone walls of the Burren in the west and the not-to-be-missed, 5,000-year-old passage tomb of Newgrange just outside of Dublin in the Boyne Valley. Sports are a major part of Irish culture. We have our own version of football called Gaelic Football, which you may have encountered if you lived in parts of the U.S. with a Gaelic Athletic Association, such as near Joint Base San Antonio. The home of Irish sports is Croke Park in Dublin. You can book a tour of the park where you can learn the dark history of both the stadium and Irish sports. You’ll learn more in that stadium than you will in any museum in Dublin, and that’s coming from an Irish history major! When offered something such as food, drink, gifts, or a compliment, always politely refuse—Oh no, I couldn’t possibly, but thank you! It’s polite then to accept after refusing a couple of times. You should never actually completely reject any offering, and especially not an offering of food or drink. In Ireland, there is always time for tea! Tea should have a “drop” of milk and sugar; tea with lemon is British, and you should reserve such requests for visiting that country. Tea can also—and regularly does—mean coffee. “Going for tea” or “having tea” is the same in the US as going to a coffee shop; there are other drink options. Want to see the artistry a monk can create? Check out the Book of Kells at Trinity College in Dublin. Want to see the preserved head of a saint from the 1600s? You can do that, too! St. Peter’s Church in Drogheda (north of Dublin) houses the shrine of St. Oliver Plunkett. It’s a surreal experience to step into the quiet of the church from a town heavily entrenched in Viking structures. Keep it down! Expect bus conductors and the elderly to chastise you for speaking loudly. It's considered poor manners to raise your voice to a level where others can overhear your conversation. If it isn't raining, expect everyone you encounter to comment on the great weather. Why? It rains for about 11 months a year. It doesn't get that lush and green all by itself! September is your best chance for a good mix of low rain days, warm temperatures, and low crowds. The Irish love their potatoes; paleo and Atkins enthusiasts, prepare yourself because the Irish have no bounds to the way they can sneak a wee spud into a meal. Making jokes about the Potato Famine, however, is insensitive in a way that can only be described as akin to making Holocaust jokes. As any military family well knows, talking politics and religion in any public place is inadvisable, particularly in a country that still struggles with the remnants of ethno-religious conflict. Innocently inquiring about the conflict in public will also not be welcome. Most of the population of the Republic are indifferent—though sometimes just publicly—to the situation with N.I., but that isn’t the case in N.I. Do a little research in advance, and if you have any specific questions, please don't hesitate to send them my way.